During this interactive session, discover ways to re-shape your relationship with things, and learn how you can enjoy more happiness, more freedom from stress and accomplish more in your life by considering different ways to take control of your space and your time. You'll come away with real tools & strategies you can use to simplify your life and truly be more....with less. 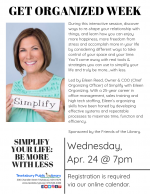 Led by Eileen Reed, Owner & COO (Chief Organizing Officer) of Simplify with Eileen Organizing. With a 25-year career in office management, sales training and high tech staffing, Eileen’s organizing skills have been honed by developing effective systems and repeatable processes to maximize time, function and efficiency. Sponsored by the Friends of the Library. Capacity: 16 of 60 spaces available.